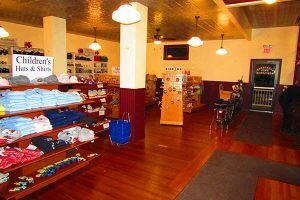 The historic Schroeder Mercantile Store will begin its first full season as the gift shop and bookstore for the Illinois Railway Museum starting March 31, 2018. The Schroeder building was originally located on North Main Street in Union but was relocated to the IRM property in the 1990s. A long-term project to completely restore and rehabilitate the building was completed in late 2017 and the building served as the museum entrance and gift shop for the Happy Holiday Railway event in November and December 2017. Starting with the first public event of 2018, the Bunny Trolley Hop, the Schroeder Mercantile Store will be home to the museum’s official gift shop and bookstore. The building will also serve as the weekday entry point for people visiting IRM. The building replaces a pair of railroad baggage cars located adjacent to the East Union Depot; these cars will be relocated and reconfigured for storage and public display.